الخيار الأفضل للحصول على المتعة والاسترخاء, Metro Inn Ryde يقع في منطقة Ryde في سيدني. لا يبعد الفندق كثيراً عن مركز المدينة، فهو يقع على بعد 15.Km منها. في حين يستغرق الطريق منها إلى المطار حوالي دقيقة. كما يمكن الوصول بسهولة إلى Midway Shopping Centre, Midway Family Medical Centre, نورث رايد. ببساطة كل الخدمات وأساليب الضيافة التي تشتهر بها Metro Hotels تجعلك تشعر وكأنك في بيتك. يمكن لضيوف الفندق الاستمتاع بالميزات التالية على أرض الفندق: واي فاي مجاني في جميع الغرف, خدمة التنظيف يوميًا, خدمة غسيل ذاتية, خدمة سيارات الأجرة, تخزين الأمتعة . في الفندق غرف نوم يتجاوز عددها 40، كلها مجهزة بعناية وجمال وبعضها مزود بـ تلفزيون بشاشة مسطحة, سجاد, قهوة فورية مجانية, شاي مجاني, بياضات. إن مسار جولف - ضمن 3 كم, حمام سباحة خارجي, حديقة هو المكان الأمثل في الفندق للاسترخاء وتفريغ طاقتك بعد نهار طويل. مهما كانت دواعي سفرك فإن Metro Inn Ryde هو خيار ممتاز لإقامتك في سيدني. يُرجى ملاحظة أن ساعات عمل مكتب الاستقبال هي كالتالي: من الاثنين إلى الجمعة 06:00 AM -10:00 PM، السبت 07:00 AM - 10:00 PM، الأحد 07:00 AM - 08:00 PM. يجب على النزلاء الذين يصلون خارج هذه الساعات الاتصال بالفندق مسبقًا لترتيب تسجيل الوصول. يرجى الاتصال بالعقار عبر بيانات الاتصال الموجودة في تأكيد الحجز. I would say my stay is comfortable and convenient. The good thing about this place is that all rooms have free wifi. There are also ample parking space. Though its just a standard inn but our stay is pleasant. No issue with the accommodation - even though on a busy road, couldn't hear any road when trying to get to sleep. POWER Shower - Great pressure and I was on the second floor. Small meal selection but what I ordered was fresh and quick. Not far alone the same road you will find plenty of Chinese Vietnamese and other eatery's. We drove from Brisbane. My wife had a conference at West Ryde while I had business at Condell Park, Pymble and Mosman in the course of our two day stay. The Metro is ideally located for access to major roads making my days easier, given the horror that traffic in Sydney can be. Plus easy access to top Ryde for restaurants and shops etc. Had a great stay. Even though the hotel in on the very busy Victoria Road, there was no issue with treffic noise - even while we were having dinner at the front of teh building, you could hardly hear any traffic. The only issue was the length of time to run the shower to get hot water but once it was there it was great. Run down. Attempts to upgrage extremely poor. Staff were uninterested and had poor English. The whole place could do with a spring clean and some quality maintenance. Avoid staying there. No change in breakfast menu and Dinner for 4 days of stay. Requested for water bottles on emergency numbers (Mentioned on telephone to call after office hours) but refused to provide saying counter is closed now. We were pleased to be upgraded to a larger room with kitchenette. Although on a main road, it was relatively quiet. The decor was fine. Poor details included: No soap on bathroom. A wet towel was left in the freezer compartment of the fridge. Dining table and worktops had sticky spill on them. No cleaning equipment - wetex washing liquid etc. Only two cups, saucers and drinking glasses. No plates, bowls or cutlery if we prepared or brought in a meal. The hotel is fine , clean, near the train station and quite etc. Closing restaurant on Saturday and Sunday made us difficult as there were no restaurants near by. Similarly the service houris limited which is not comfortable for the guests. 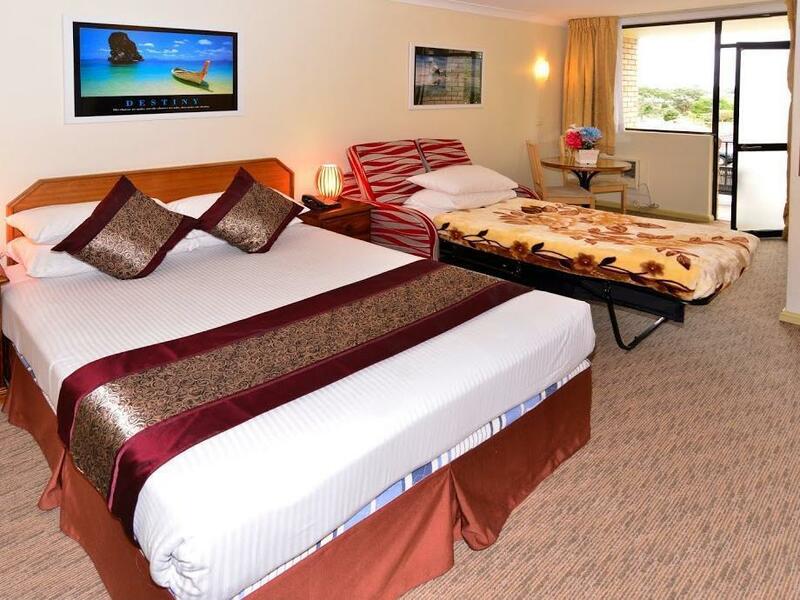 This is a good hotel located near Ryde city center. However, we experienced some strange noise every morning at around 6:30 a.m. it seemed water flowing. Apart from this, this is still a good hotel.